Here's my first Christmas card for 2018. Very grateful for the time, health, and opportunity to just sit and play. Last year I was recovering from surgery and the year before I was sick in Belgium, so it's been awhile since I had the pleasure of making a Christmas card. At least I think so -- I haven't gone back to check! 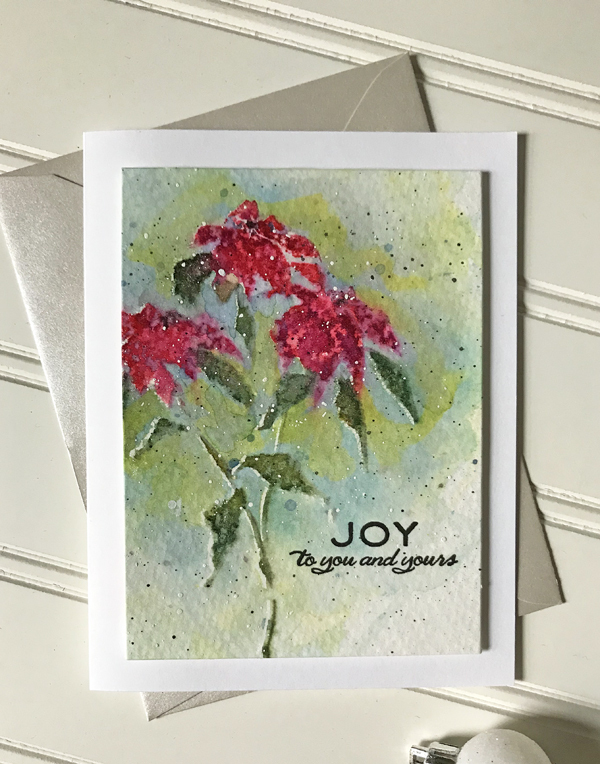 This uses Penny Black La Fleur Rouge stamp and a sentiment from W Plus 9 -- both have been around for a while. 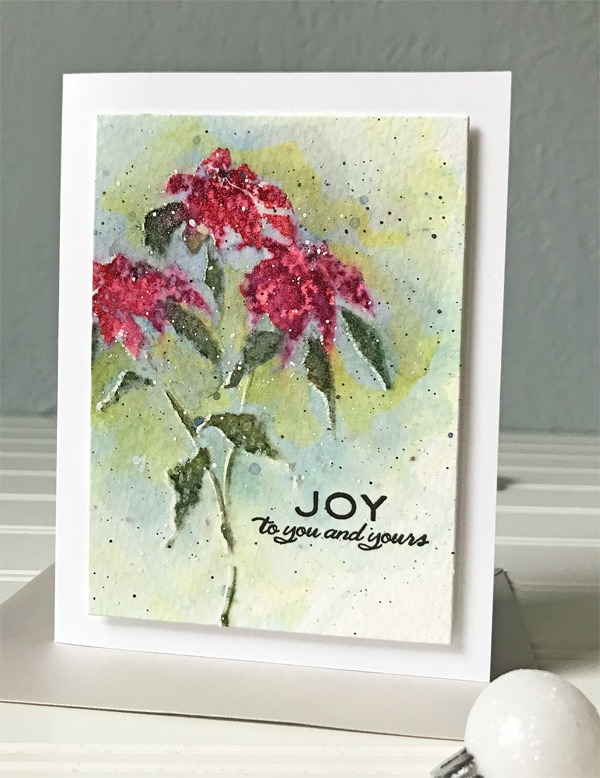 I stamped it multiple times with Tombow Watercolor Markers and misted with water. 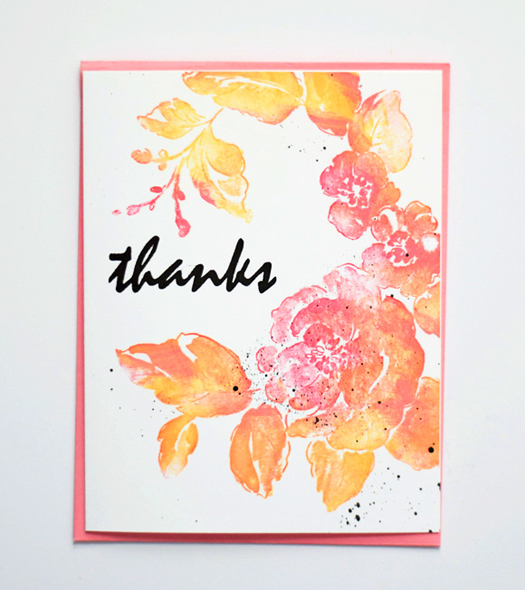 Then I stamped with Versamark and embossed in clear and watercolored around the image. 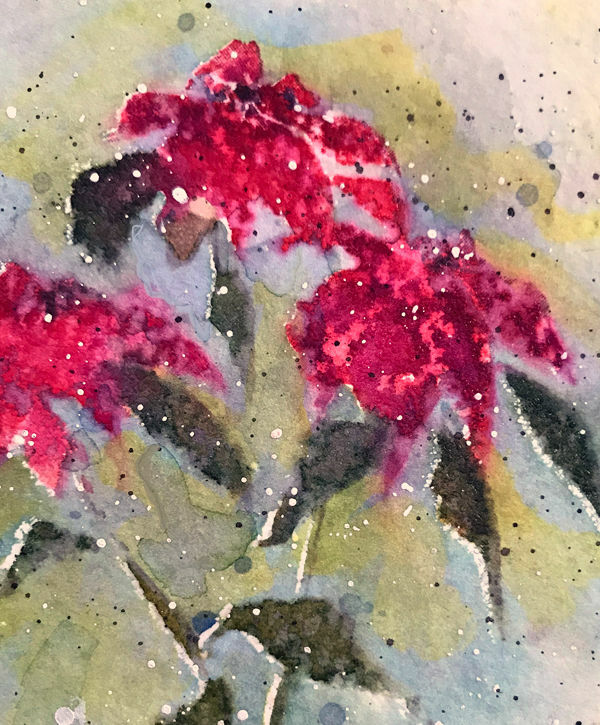 The white edges around the stems and leaves are the places where the embossing powder melted. I like the look. 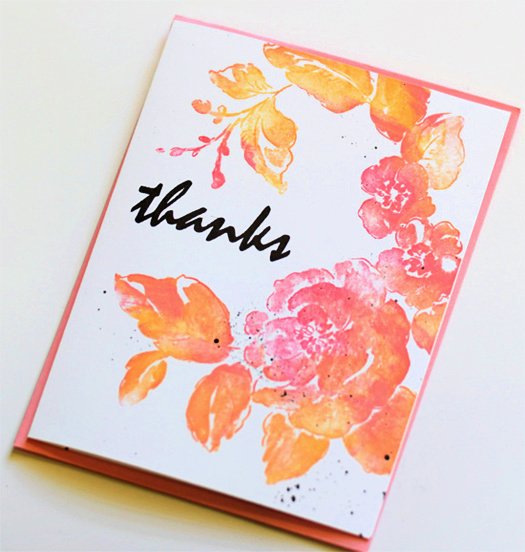 Here's a picture of the layers of watercolor and splatters. So much fun to make! I took this picture in our bedroom. That blue wall is like the rest of the house -- textured plaster. I've yet to find the right light for photography in this house, but this will do for now. LIFE UPDATE: The move to Dallas has been full of happiness and some tears. Both of us are very happy we made the move, and both are homesick. We like the city but we need time to adjust. The section of the city where we live -- East Dallas -- is full of lovely older homes and buildings. It's liveable and, particularly for me, easy to navigate. We are 20 minutes from Love Field (the airport from which President Kennedy flew back to DC after the assassination). We are about 5 minutes from the President George W. Bush library and will be going there soon. So, while it is different from what we are used to, Dallas is a good place. Living near our son has been better than anticipated. He hasn't lived near us for more than a few months in over 10 years, so there is a lot of happiness on all sides. We have also spent a fair amount of time with Mike's brother and his family, who live nearby, and are looking forward to spending Thanksgiving with them. There is a clinic that specializes in my heart condition nearby, which is fantastic, as most cardiologists do not have enough experience with the condition and can cause more harm than good. The clinic is a participating site for a clinical trial for a new drug and asked me if I wanted to participate. In a week or so I start the process to see if I can participate. Without clinical trials, we will not more forward so I am hopeful. I'll let you know how it goes. Today we are hosting a small get together for a few neighbors. And one of them is -- get this -- a stamper who reached out to me because she reads this blog and recognized my description of where we live. She is 3 blocks away!! We met for lunch and she is awesome. I AM SO EXCITED. I hope to be back with more cards later this week. I scanned the intake sheet: James Kolacki (not his real name), 24, unemployed. Wants to appeal a denial of social security disability (SSD). One of the other lawyers or paralegals in my legal aid office must have been on vacation or overloaded, as I rarely handled that type of case. Ok, time to learn something new. James had pale white skin, blond, almost white, hair, and pale blue eyes. Very thin, he looked about 18. His father, Mr. Kolacki, was with him. Mr. K was graying and looked older than his age (50). I soon learned why. It is difficult to get SSD, and very difficult when you are young. Before the government will agree to pay, you must meet the definition of disability in the social security laws. The older we get, the easier it is to meet that test -- back problems, arthritis, cancer etc. all become much more common as we age. At 24, however, the odds were not in James' favor. Right from the start, Mr. K took over the appointment and explained that James lived in supported housing, ran by a local non profit, for adults with developmental or serious mental health issues. Mr. K handed me the paperwork denying SSD for his son, and said he wanted to appeal. It's tricky when an adult comes in with a parent, child, or other adult who is answering all the questions. So I went out of my way to explain to James that I was his attorney, not his father's, and that I wanted to speak privately with James. Mr. K got up to leave, but James immediately said it was ok for his father to stay. Mr. K sat down and I looked at James and asked him why he thought he couldn't work. His father immediately answered for him. "James has schizophrenia** and cannot hold a job." He then handed me a one inch thick medical file. I needed to hear from James, if for no other reason that James would need to testify and I had to assess his ability to do so. So I sat back and said to James, "Tell me about your life. I know your Dad can explain it but I want to hear it from you." And then I said to Mr. K, "If it's ok, I'd like you to sit back and just listen for a bit." Mr. K nodded. Without looking at me, James said, "I live with my parents and I got fired from my job at Taco Bell." "What reason did Taco Bell give you for firing you?" "I got upset. I couldn't stay there at the cash register so I left in the middle of my shift and they fired me." James looked a little agitated and kept staring at my certificates, so I decided to change the subject and ask something simple. "Did you graduate from high school?" I caught a look of immense sadness come over Mr. K's face. Before James could respond, Mr, K said: "Yes, James graduated 3rd in his class. And then he went to the University of Virginia for 2 years. When he was a junior at UVA, he had his first psychotic break and moved back home." In the 3 years that I had been practicing as a legal aid lawyer, I had a lot of clients with serious mental health issues. Although they were a small portion of my practice, they took up a lot of my time. Sometimes their issues seemed comical, even though underneath they were deadly serious and tragic. Nevertheless, it seemed I connected with them better than with my "healthy" clients. For example, Gail (not her real name) kept filing lawsuits against Picasso (his real name), even though Picasso was dead and Gail had no connection to Picasso. I had learned the hard way not to argue with Gail about those facts. Rather, I convinced Gail to stop filing suits against Picasso because Picasso wasn't in the US and the US courts didn't have jurisdiction over him. So, I had a little experience dealing with people suffering from schizophrenia and, tremendous sympathy. Schizophrenia is one of life's cruelties. I was powerless to address the schizophrenia -- all I could do was work around it and help my clients get what they deserved. In any event, I understood why Mr. K was answering the questions for James and I was beginning to understand why Mr. K looked older than 50. But, before I could respond, James stood up and stated: "I don't want a woman lawyer. I want a man. I don't like being near women." Mr. K explained, "James is afraid of women. He thinks they have powers to kill him. He couldn't handle working with or serving any women at Taco Bell and that is why he left in the middle of the shift. Please don't be offended. It's part of his illness." We had a policy in our office that we would not respond to clients' prejudices -- if you didn't want the Jewish lawyer or the woman lawyer or the guy with red hair, you were out of luck. But James was different. This wasn't stupidity or prejudice; this was part of James' illness. "Well, give me a moment. I want to talk to one of my colleagues." But before I got to the door, James also stood up, walked over to my law school graduation certificate and, pointing at it, said, "Well, I see you went to a Catholic law school. I will take you as my lawyer because you are Catholic." I decided not to share with James that I was not a practicing Catholic. "Well, good. Let me look through the file your Dad brought." I scanned the papers and silently fumed. James was clearly suffering from schizophrenia and had made multiple attempts at working, all of which failed. His permanent disability was documented by many psychiatrists. I knew that Social Security had denied James because the Reagan Administration had a policy of denying all SSD claims and forcing everyone to file an appeal. As a result, the appeals process was overwhelmed with claims. Even worse, many people didn't understand how to appeal and didn't go forward. This was especially cruel because SSD comes with eligibility for Medicare (after a waiting period). No SSD, and often no health care for the most vulnerable. I explained this to James and his Dad but also told them that our office had a pretty good track record for winning at the hearing officer stage. In the event we lost, we could file in Federal Court. The hearing officer was a kind man. He listened to my presentation, chatted with James for a few minutes, and took my binder of documents supporting James' claim. While he was reading the doctors' statements, James blurted out that if the hearing officer thought he should try and work, James would try again. It was heartbreaking. I saw the empathy in the hearing officer's eyes. After a moment, he put down the file, looked at me, and asked if the SSD checks should be made out directly to James or to Mr. K as his guardian. James agreed to let his father get the checks. So James got SSD and the health insurance (Medicare) that goes with it. I was thrilled. It was a small victory against the disease and the system that tried to rob James of his chance at a decent life. I wasn't sure what the future held for James, but I imagined a relatively stable life, living near his family and doing as well as could be expected. Mr. K was hugely relieved and thanked me over and over. James looked away and didn't say anything. I never saw James or Mr. K again. But about 10 years later, I noticed a short article in the Washington Post. Apparently James had moved to Staunton, Virginia and had been living in a boarding house. A fellow resident had shot and killed him. James was survived by Mr. and Mrs. K and 2 siblings. The police were investigating. Oh, James, I'm sorry. I'm so sorry. ** James wasn't "a schizophrenic." Just like I'm not a heart disease and others are not cancer. James was a human with a disease. Although research continues, treatments have not changed much since James died. You can find more information on schizophrenia here.